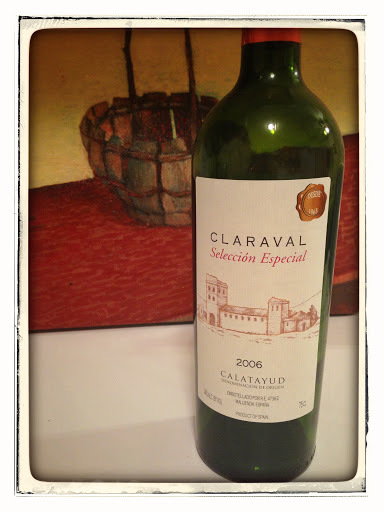 Claraval is a label of Bodegas y Viñedos del Jalón. Founded in 1999 with the objective of continuing the agricultural development and traditional wine production of the Calatayud region, Bodegas y Viñedos del Jalón today has about 1000 hectares of vineyards. With its continued support of hundreds of its wine growing families, it is considered Calatayud’s best cooperative. Claraval refers to the stained glass arched windows of the famous Monasterio de Piedra in the area, which was the inspiration for the label. Dark garnet in colour, after decanting aromas of candied fruit and warm spices swirled about in the glass. Silky smooth tannins joined black current and cherry flavours in the medium body. Spicy black pepper and warm toasty oak comprised the moderate finish. Although rather ordinary in flavor [and I surmise this is because it is getting past its prime], it is an easy drinking glass for the table.